I thought it was bad, but this evening’s run confirmed all suspicions. Erik was kind enough to finish his run with me, giving me a pacing partner. Unfortunately, he made the choice to run on the opposite side of the road than the side I usually run on. I must have looked a little crazy as I dove towards him, yelling at him to get to the other side. To say I have running habits is an understatement. I listen to the same music each time (Matchbox Twenty’s More Than You Think You Are), run the same route (out the neighborhood, down the main road and along the river), wear the same necklace (run. 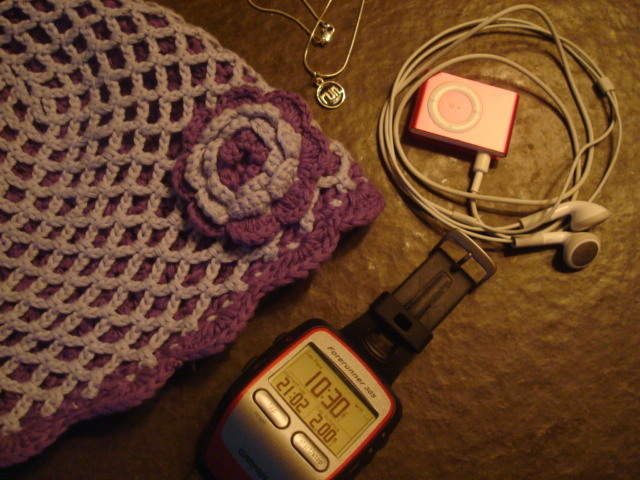 ), keep my Garmin on the same screen and wrangle my hair back with the same knit hat. I loathe getting new shoes because they feel different. I even get upset if I have to use my hands to wipe sweat, as I can never remember exactly how I had them before and the whole feel of my form gets thrown off. While most of these habits make my runs feel natural and safe-I truly believe my necklace gives me a boost of energy when I need it most, it is time for a new play list. And I will have to venture off my usual route when it’s time to break the 5 mile marker. Just the thought makes me shudder. What habits do you have when it comes to running? How do you deal with shaking things up? Crosstraining: Does sleeping in count? Good for you recording your start with running! I have been running off and on since 2001 (and strongly ON for the past 1.5 years), so here are my newbie tips for you. 1) Be careful about running the same route and having a routine. You can never be too safe against potential crazies that know your route and routine. Especially because you have headphones on, making you less aware of your surroundings. Mentally tell yourself to mix it up for safety purposes, including no music. 2) Even if you like your shoes, make sure you change them out every 300-400 miles (every 3 months for me or injuries come). If you wear orthopedic inserts, placing those in your new shoes makes them feel like your old shoes instantly. 3) Since you are low mileage right now and mentioned two sides of the road with your husband, I am assuming you are running on sidewalks. a) run towards traffic, even on the sidewalk. A young boy was hit and killed by a car that swerved on to the sidewalk not too long ago in my neighborhood. This is in a nice, quiet suburban area. b) once you reach 5+ miles check out http://www.halhigdon.com for some plans and start running on the actual road (towards traffic in a bike lane) or better yet, find a Greenway or trail. Your chances of shin splints with the higher mileage and sidewalk are exponentially increased if you stay on the sidewalks or jump too quickly on the mileage. Oh, and one more…PLEASE, PLEASE wait until you have a full year of running under your belt and 25-30 miles a week before you start thinking about training for a marathon (additional 18 week plan). It’s an injury disaster waiting to happen, and makes the marathon a bucket list item instead of an accomplishment you really worked for. But that’s the momma side of me. My Dad ran a 2:40 marathon, and I have been working too hard to reach my potential since then knowing I have the running gene in me (leading to many injuries along the way and about a billion bits of tips I could share that you don’t need). The most important thing is to HAVE FUN, enjoy what you are doing, and don’t push yourself too hard! Angela-thanks for the great tips! This isn’t my first time entering the world of running-just hitting the re-set button on my training after taking a month off to get use to the new job. My coach/husband has me starting on low mileage this week to get back in to the routine, which is proving to be helpful. I’m excited about working slowly and safely up to where I need to be by January 2012 for the first Disney race! All good thoughts above! Only recently have I been able to run without shin splints, knee issues, etc. setting in…but, running sort of comes with those sorts of things. I’ll count myself lucky that I haven’t had issues yet, especially being pregnant. I also like routine! I like to run the same places and listen to the same music, granted a lengthy play list. I actually have calm music to run to and energizing music to run to. At night, I love to run to U2 or something like that. But if I need motivation, I kick it up a bit. I highly recommend trail running. It’s fantastic. Seems like it’s good for your soul as well as your body! And, the benefit there is that the tilts of the sidewalks and roads don’t play as much of a factor in injury, which is how I developed my shin splints several years ago. Granted, the uneven ground, roots, rocks and the like may. As for shoes, I’m with you there too! But I would agree, inserts help TONS with that. My feet feel naked without them! Not changing my shoes often enough resulted in my knee issues and plantar fasciitis one year. Oh…live and learn, right?! I hate it because every time I seem to go in to get new shoes, they’ve discontinued the model I like, so that was always my stumbling block. Congrats on getting back at it! Running rocks! I’ll be excited to hear how you’re doing as you train! I myself and hoping to run the mini next year…baby steps for me (no pun intended 🙂 Best of all…ENJOY IT! And good luck with the new job! P.S. Disney fills up fast even though a gazillion people run it. It’s #2 on largest numbers, I think. If you haven’t registered, make sure you do that soon!